Photo courtesy of UCF Athletics Communications. 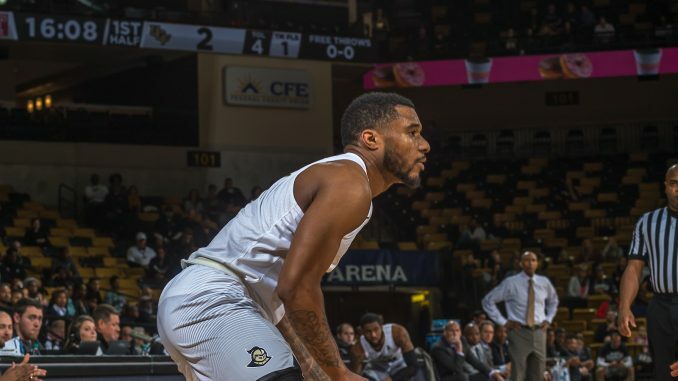 UCF Men’s Basketball suffered its second conference loss of the season Wednesday night, falling to UConn on the road by a score of 62-53. The Huskies, who had lost four of their previous five games, fared far better than the Knights’ last three opponents, becoming the first team to score 60 points against UCF in the past five games. The two teams traded small runs in the first half that kept the game within six points, but a three at the buzzer by the Huskie’s Terry Larrier sent UCF to the locker room with a 30-21 deficit. UConn came out of the half and stretched the lead to double digits within the first two minutes of the half. The Knights were able to cut that lead down to four off a Tacko Fall layup with under seven minutes to go, but that was as close as it would get. The Huskies went on an 8-0 run after that to stretch the lead back to 10. The Knights tried to fight back using fouls and three point shooting, but could not hit enough shots. The Knights – who are 11-0 when they score 60 points – were once again plagued by subpar offense. They finished the game shooting 37 percent from the field and 24 percent on 21 three-point attempts. They were also outrebounded 31 to 29. Ceasar DeJesus led the Knights with 13 points, followed by Terrell Allen who had 12 and Fall with 11. A.J. Davis struggled, finishing with just two points and four rebounds on 0-6 shooting. UCF is back at home on Tuesday against Cincinnati.